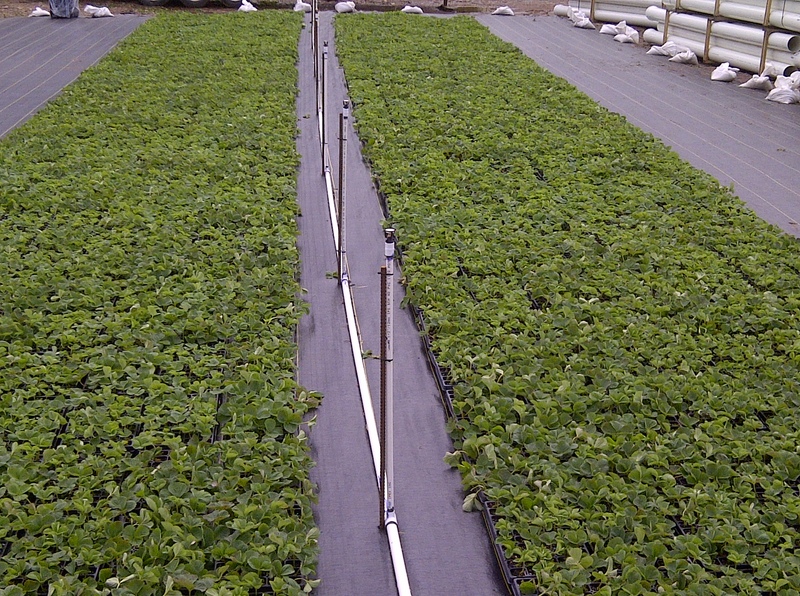 This first in a series of webinars was held on August 8, 2013 for North Carolina strawberry growers who are planning to propagate their own plugs and possibily save some money. Highlights of this webinar are included below. Dr Frank Louws, plant pathologist, contributed a disease management leaflet to the program. This leaflet was discussed and mention was made of how Dr. Louws prefers the outdoor production environment for plugging. What about fertility of plugs? Thus, an argument is being made here to go with only 1.125 lb of the 18-18-18 fertilizer, or about 100 ppm. We do not have any guidelines to provide on fertilizer source at this time, and for many years I have been saying that a greenhouse grade 20-20-20 would be ok to use, but this article from PA is saying that calcium nitrate is a better source in the 3rd and 4th week. I have taken the view that it may be better to apply the fertilizer in the morning, than the evening, so that the plugs are not too wet going into the night. I am in Eastern NC and I just received my tips today (9/11), and I was wondering how long can I hold the tips? I won’t have any labor to stick tips until this Saturday (9/15). Answer: My experience with tips that are coming down from PEI or Nova Scotia is that they have a very good shelf life. If you are able to hold them in a cooler at say 35 F, then you should have no problem with holding these tips until this weekend. You can pretty much count on having a good week of excellent shelf-life if the tips are kept cooled and are in plastic liner. Another pointer is to get you labor there early in the morning! Try not to stick tips in the warm part of the day. What is a good misting schedule? Answer: One large propagator I know simply runs the mist every 3 minutes for 30 seconds for the first 3 days. I know of another propagator who insists on running the mist constantly the first day if it is hot. Below you will find a “recipe” that I have been following for plug misting under NC conditions in late summer for a number of years. I would like to say that if it is quite hot on the first day of rooting (Day 1), I am willing to go with running 20 seconds of mist every 1 1/2 minutes. You have to use your judgment! Your goal is to keep the leaves moist until the tips start to create their own roots. Hot, sunny days will require extra mist, while cooler, cloudy days less mist. Plugs should be standing up and turgid in the morning (not flopped over), and if the day is warm, I would continue with the more intensive misting cycle (20 seconds every 2 ½ min) for the 2nd day, from around 8 a.m. until about 6:00 to 6:30 p.m. (DAY 2 and 3 are ultra critical, and you must have someone be responsible for monitoring the system very closey). If warm/hot, stay with 20 seconds every 2 ½ min from 8 a.m. until 6:00 to 6:30 p.m. I tend to be more conservative than some “pluggers” and I am inclined to go with 10-15 seconds every 5 minutes. This may result in too much misting? 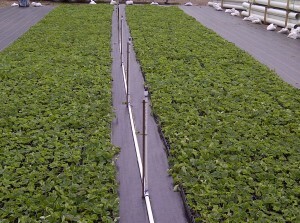 You do not want to saturate the soil media with water (you will know this if the trays are “heavy” to lift up). The idea is to make sure the leaves always have some droplets of water. Some propagators will go to a 10 seconds every 10 minutes for days 4-5. By the the 6th day you should be seeing some new rooting in the plug cell. At this stage you may be able to go with misting from 9 a.m. to 6 p.m. for 10 seconds every 15 minutes. On day 6 the first watering of the day should be long enough to completely wet the soil. The misting schedule after the first week must really be determined on the basis of well the plugs are rooting up until this point and weather conditions. In other words, the right misting schedule will vary depending on conditions. Some propagators have found success on days 8-10 by misting from 9 a.m. to around 6 p.m. for 15 seconds every 30 minutes, and then they lengthen the interval each day. The actual misting period may stay at 15 seconds, but on days 11-13, you can consider misting from 10 a.m. to 3 p.m. each hour. By day 14 the plugs should have an excellent root system, and from this point on, the practice is to sprinkle for 5 minutes at 1 p.m., and then again in the late afternoon if temperatures are high. This webinar was sponsored in part by NC Strawberry Association, Southern Region Small Fruit Consortium, and N.C. Cooperative Extension.